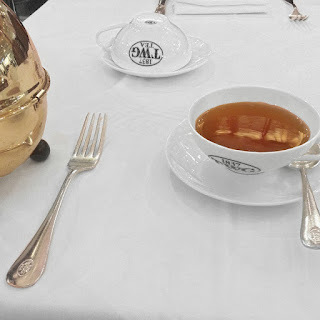 A couple of weeks back, after hearing good reviews about TWG Tea from my friends and reading about it online, I was craving for some fancy tea time indulgence. 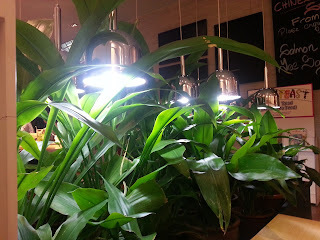 As Sunway Pyramid had the closest outlet from my home, I decided to give it a try. My first impression was that the aesthetic was very classy and elegant. The high glass walls with gold trimmings played beautifully with the wooden counters, tables covered in white and beautiful tableware. The waiter who ushered me to my table was very friendly and informative. After a long (really long time) picking which tea I would fancy, I settled for the Earl Grey Pu-Erh (RM21). I really enjoyed this tea as it was a smooth blend of classic Earl Grey with the subtle notes of Chinese Pu-Erh. I'm really a fan of Pu-Erh tea and this soothing blend did not disappoint. Also, the teapot is 18k gold-plated! Like how often does one get treatment this exquisite? Unfortunately, the teapot (non-refillable) only gives 4 small cups of tea but it is enough for one person. I was really craving waffles that day and jumped at the first sight of them on the menu. The waffle arrived about 20 minutes after I ordered it. 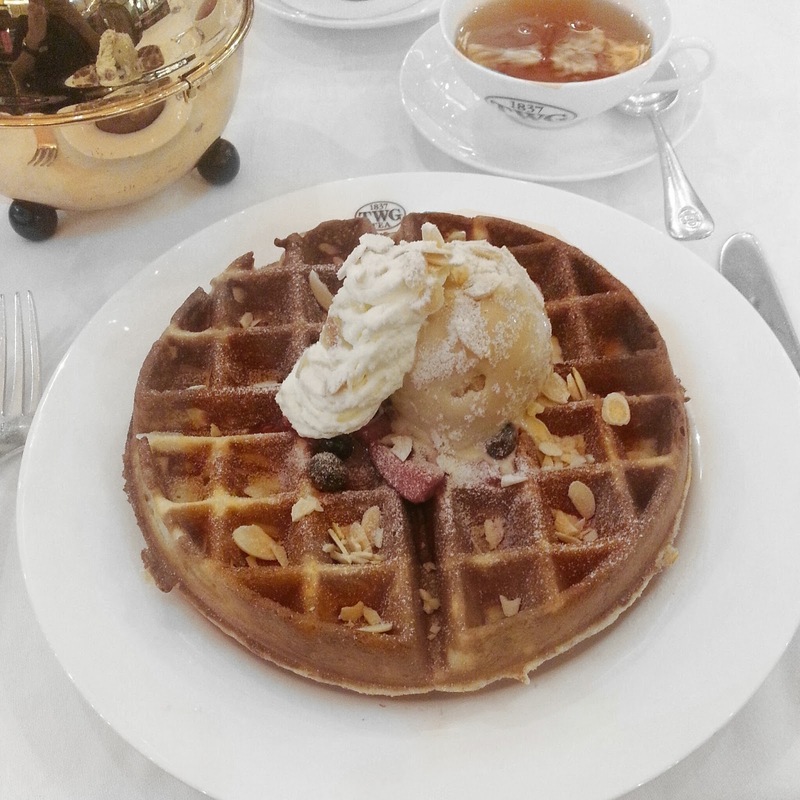 I was really happy with the size of the waffle and the generous scooping of Signature Tea infused Vanilla Ice Cream. I spent another 25 minutes devouring the waffle until the plate was left squeaky clean. It was really very pleasing on the senses (also very filling). I enjoyed the mix of blueberries, strawberries and blackberries with the warm waffle and cold ice cream along with shaved almond pieces which gave a little crunchy edge to the whole dish. It was truly delicious and worth the price for its size. 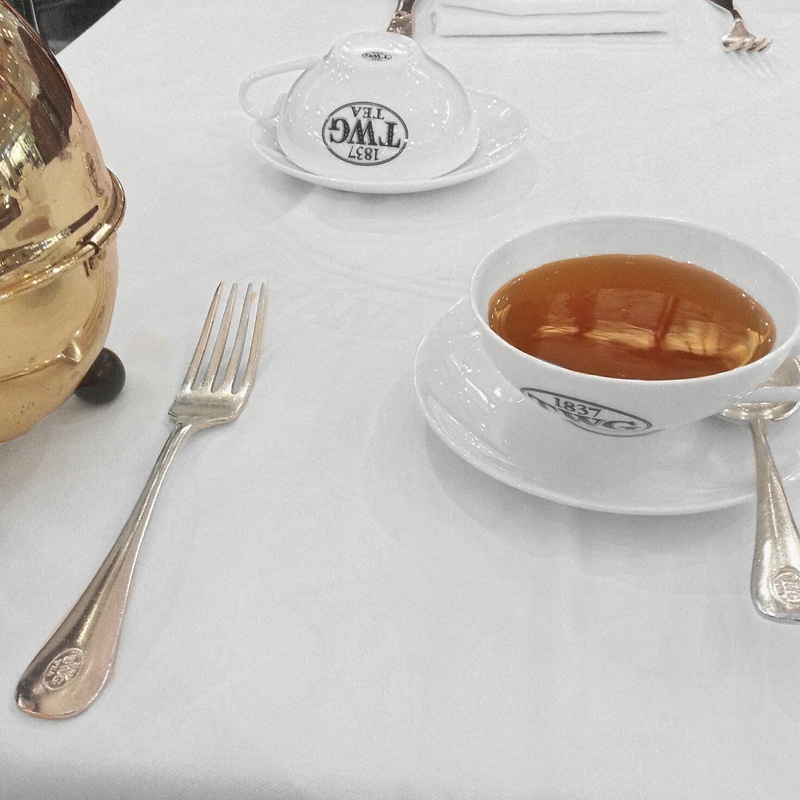 If you are looking for a more indulgent treat and don't mind spending a little extra for the luxury, I would recommend you to try TWG. They also have other dishes on their menu which includes their oh-so popular tea infused macarons and scones with clotted cream and tea jelly. I will definitely try their scones the next time I return.